Grand Canal - The Grand Canal is the longest and oldest (still in existence) man-made river on earth and connects the two great rivers (Yellow and Yangtze) of China. It stretches 1,104 miles (1,776 km) making it the 76th longest river in the world and provides the country with a major north-south water route. The distance between the two rivers is actually less than that but parts of the Grand Canal extend beyond the Yellow and Yangtze. It begins in the north at Beijing and ends in the south at Hangzhou. 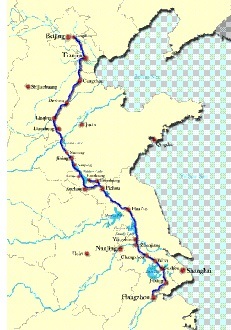 Various sections of the canal date as far back as the Zhou Dynasty in the 5th century B.C. and the reign of King Fuchai of Wu. At that time they were not built to connect the two rivers to each other, but to connect them to other smaller tributaries. But with the reunification of China under the Sui Dynasty, a national effort was undertaken to build one giant canal connecting north and south, which historically had been divided politically and geographically. A canal of this scale would serve to bring the two regions closer together. Emperor Wen (see above) began the task in 684, three years into his reign, and it was completed by Emperor Yang in 618, the same year as the end of the Sui Dynasty. Like the Great Wall, the construction of the Grand Canal cost a significant number of lives of those compelled to work on it. One of the benefits of the canal was that it allowed citizens to move further away from the two great rivers (which were prone to flooding), and still live along a major supply route. Rice became the most widely shipped commodity. It obviously had a strategic purpose too, as it allowed the empire to move soldiers north and south more quickly. 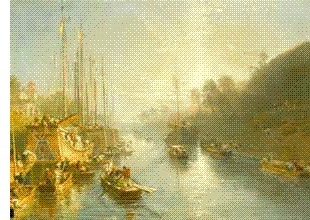 Over the years and centuries, the canal was both deepened and widened so as to allow more traffic and larger barges travel along it. Although the land through which it runs it relatively flat, there is as much as a 138 foot (42m) difference in elevation from the highest point to the lowest. This complicated travel until the pound lock was introduced in the 10th century during the Song Dynasty. Today the canal contains a total of 24 locks and is traversed by 60 bridges.